Last year Skateboard Scotland in association with SYB brought together all of the outdoor Jams to form the 1st Concrete Slayer Series. This was something that had been talked about by the board for a long time, SYB forced our hand and this will now be an annual event. The Series is set up to try and get everyone to attend all of the different jams throughout the summer and score points with a formula 1 style scoring system. 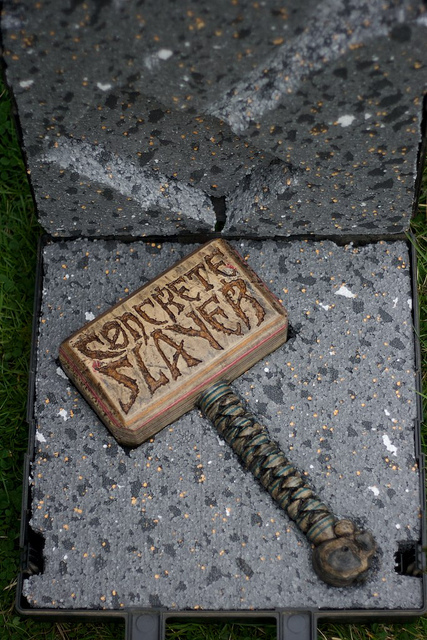 The top ten at each jam score points and these are collated over the series with the winner at the end of the year winning the Concrete Slayer Hammer (see pic below) along with whatever cash Skateboard Scotland can pull together over the year. This year the man to beat is Martin (socks) Maguire so make sure that you get to all of the events and skate tough. The events will be held as following this year with the Final being at the Perth Jam on the 1st of September. See you all there and Shralp Ya Bas!